A little known fact about me is that I spent the first six years of my life in the countryside outside of Philadelphia. I hope heaven will look a little like our land on Ivy Mills Road. I have so many warm and sparkly memories from that era. Recently, the masterminds behind Anthropologie and Urban Outfitters started a home and garden shop called Terrain at Styer's. It's been getting a lot of press lately--I first noticed it in Domino. Looks pretty awesome. I saw this picture and thought, "Hmmm, that looks familiar." One of my earliest memories took place in this lofted greenhouse. I was walking with my mom, as she picked out potted plants to take home. Oddly, I can still remember that "Constant Cravings" by kd lang was playing (which should ruin the memory, but doesn't). Styer's has been in Glen Mills for years, right around the corner from our old farmhouse, but it just so happens to be the next big thing in designer gardening. Have you gone by your old house in the past several years (I'm not sure when the last time was that you've been in the area)? They've added on to your already-beautiful house and it looks amazing. I can remember every single room in that house and every time I pass by it with my hubby (who's obviously never been in it) I always tell him that's my dream house--loved it! Actually the last time we drove by it was when we were in town for your wedding! I think the big addition was already there, and we were floored by how good it looked. I recently took a good long gander at it, though, on Google Earth. Oh, childhood. Why did you leave me? Oh, sweet memory, nostalgia... wistfulness. Those were definitely some of the best years ever! But don't forget the summers were dang hot and sweaty and the bugs, except the fireflies and praying mantises, were nearly unbearable. Just a little reality check to comfort our longing hearts. 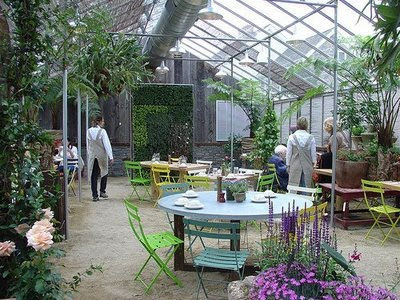 Let's have lunch or tea, or whatever they're serving, at Styers next time we're there!